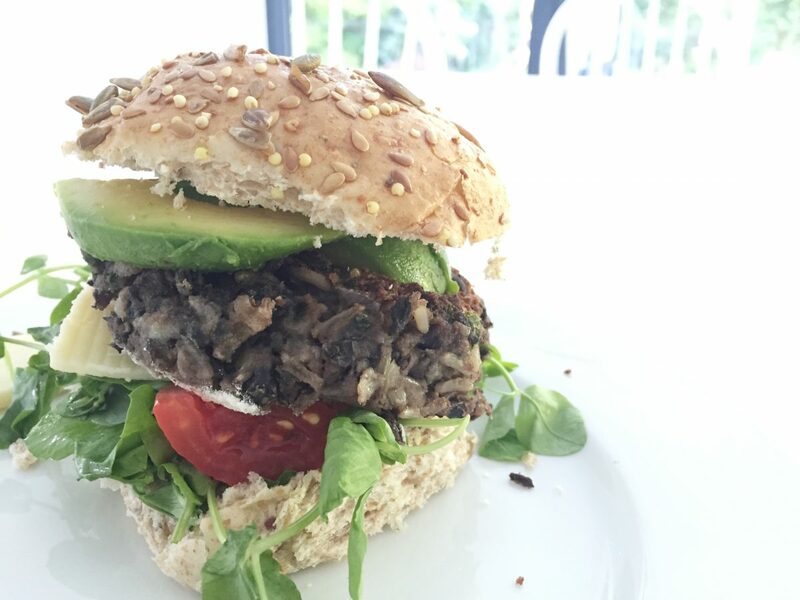 These protein-packed black bean burgers are one of our favourite meat-free Monday dinners. I know they don’t sound like something you can immediately imagine eating, because they do sound a bit too vegan. But trust me, they’re delicious. They pass the carnivore husband and suspicious child test with flying colours, but I love them because they’re healthy and easy to make, and give me the satisfaction of noshing a burger whilst feeling smugly virtuous. I always keep canned black beans in the cupboard and cooked brown rice in the freezer so they are so easy to throw together. You can also make them in bulk and freeze them. Black beans are easy to find in cans in the US, I buy mine at Trader Joe’s there. We’re not as familiar with them in the UK but I found them in cans with the Jamaican food in the international aisle in Tesco. I also get them in the canned pulses section at Waitrose. You’ll use black beans in loads of Mexican recipes so I’m hoping, now that Mexican food is really taking off in the UK that you’ll see them more and more. If you get into the habit of always cooking more brown rice than you need and then freezing it, you’ll be able to make these burgers in no time. 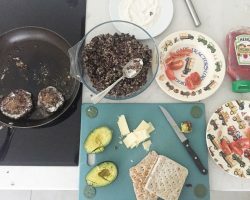 I’ve shared my foolproof brown rice cooking and freezing tips here along with other ways you can use it. Most supermarkets sell frozen brown rice now too – the frozen stuff has nothing weird added unlike the pouches of ready-cooked rice. I like to serve these burgers on seeded wholemeal buns with avocado, mature Cheddar, rocket and tomato. They go really well with these spiced squished potatoes too. I often grab one from the freezer to cook with slaw when I’m working at home. They’re also really good with my romesco sauce. The bean and rice mush is also pretty yummy before it is turned into black bean burgers as a sandwich spread, taco filling or as a dip for tortilla chips. These burgers are too fragile to cook direct on the bars of a BBQ. You could cook them in a frying pan on a BBQ though. Line a baking tray (that is small enough to fit in your freezer) with parchment paper. Place four burgers on the tray and cover lightly with cling film. Put tray in freezer until burgers are frozen. Once frozen, wrap each individually in cling film and put them back in the freezer. When ready to eat, thaw in the fridge. They may go a little sticky when you defrost them so if they do, just flour your hands and form them back into burger shapes right before you gently drop them into the pan to cook. Active prep time: 15 minutes. Cooking time: 20 minutes (plus half an hour to rest in the fridge). 2x 400g (2 x 15 oz) cans black beans, drained and rinsed (Epicure from Waitrose or Dunns River from Tesco or Trader Joe’s in US). Avocado, pickles, sliced tomatoes, cheese, toasted whole grain burger buns. Finely dice your onion and drain your beans, defrost your rice in the microwave if it is frozen. Heat 1 tablespoon of rapeseed oil in a large non stick frying pan on a medium heat. While the onion cooks, mince your garlic and chop your herbs and set aside. Add the crushed garlic to the onion for the last minute of cooking. Garlic has a higher sugar content than onion so if you add it too early it will burn. Stir in chopped coriander if using. Take off the heat and mash with potato masher until combined and mushy. You still want some texture but you need it to stick together in lumps. Taste and adjust the spices to suit your taste buds, you may want to add chili or salt or more cumin. When the mixture is cool enough to handle, divide into 8 and squeeze into a ball with your hands. Then flatten each ball into burgers so that they are about 2cm thick and the size of the palm of your hand. Cover and refrigerate the black bean burgers you’re going to cook for half an hour, or up to a day until you’re ready to cook them. See above for how to freeze the other burgers. Heat 1 tablespoon of oil in large frying pan on a medium-high heat. Gently place the burgers in the pan. If you don’t hear a sizzle, turn up the heat. Cook without moving them until they are browned and crusty on the outside and warmed through, about 4-5 minutes per side. They are very delicate so when you flip them, use a spatula or fish slice to slide underneath and put your hand or another spatula on the upper side to help them flip without collapsing. While they cook, split and toast your buns, slice avocado and tomatoes and cheese. I usually let everyone make their own burger or plate of salad. I always have a squeeze of lime and a shame-free splodge of ketchup on mine. Find more recipes for beans, freezable meals and vegan food here. I’d love to see what you end up with, so remember to share this with your friends and on my Facebook, Instagram or Twitter when you make it. Tag it #ystcook so I can see!